I think I have been overtly honest with my ability to become fanatical about random things. I mean, WIN made me watch about 16 hours of idol elimination shows, Running Man inspired me to start watching the bazillion episodes of Infinite Challenge. Oh, and the whole Korean drama thing – you get the picture. So inevitably all of my variety (and drama watching) made me interested in learning about the musical groups (okay, idol groups) that guest star or regularly appear on variety shows. While randomly looking up one such group that guested on Running Man I stumbled across a gem of an interview show (that many of you probably know about *cough unnie is a couple years behind cough*) – Weekly Idol. Weekly Idol’s set is said to be housed in a third floor basement and is entirely white – floors, walls, everything be blank. The production value is an element of the show’s comedy, the hosts claim that they could not afford chairs for the guests for the longest time. 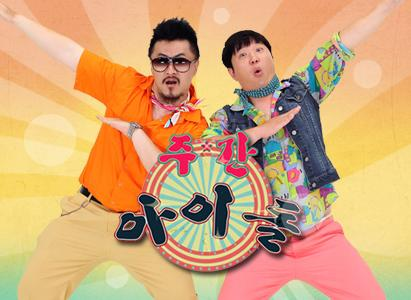 Slapstick filled and witty, Weekly Idol reminds me of Late Night back in the day…if it only had Korean idols as guests. This amazingly addicting and entertaining show is hosted by Jung Hyung Don (a comedian of Infinite Challenge fame) and the rapper Defconn. The two portly hosts have a freaking hilarious dynamic that makes this program beyond entertaining. Weekly Idol airs every Wednesday on MBC. Via hilarious games, including a segment where fans call in to leave requests and a bit involving idols verifying their individual profiles (think having to sleep on set or proving your height) Weekly Idol plays up the personable side of celebrities. And not only does this show present viewers with an interesting look at idol groups, it also plays its part as a major troll, consistently trying to get idols to say or do something that embarrasses them. Seriously, it is a troll of a show, a kind hearted troll. Major troll, maybe even super troll – love it. One idol in particular has suffered continuously, willingly (or is that unwittingly) from the trolling of Weekly Idol. The leader of Infinite, Sunggyu, has become a running gag on Weekly Idol – to hilarious effect. Kicked out of the random dance segment, and generally confounded at every turn, Sunggyu has a special place in the history of Weekly Idol. Glad you liked it 🙂 I love when he is on Weekly Idol! Where do you watch weekly idol and Infinite Challenge btw?